Key ingredients: Flour, baking powder, chocolate, sugar, butter, vanilla essence, etc. The green filler are seasonal plants. Therefore, their availability will depend on factors like season, regional reachability. The colored packing paper and ribbon can be used again for other uses. The cake is accompanied with a knife and candles. The roses were brought in Europe from China in the late 18th century. 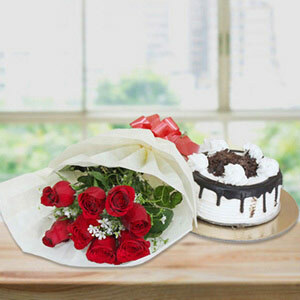 What a wonderful and reasonable gift combo to take all your dear ones by surprise! 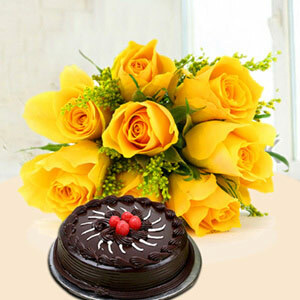 This lovely gift is a perfect present for them on their birthdays, anniversaries, or wedding parties. 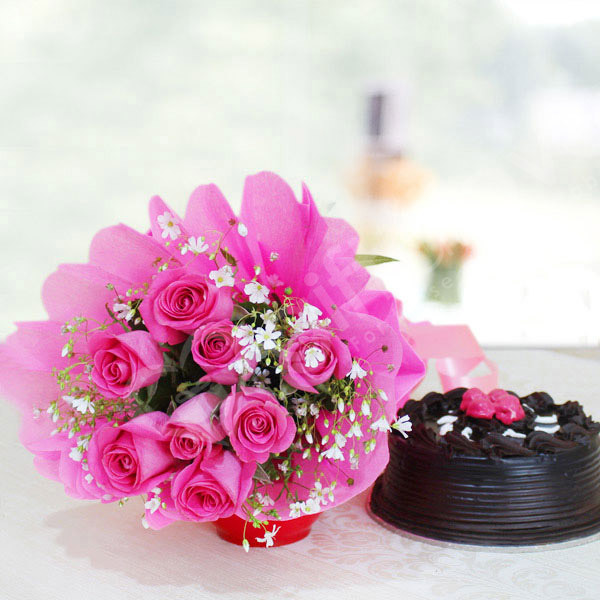 Both the pink rose bouquet and the delectable chocolate cake will remarkably express your deep sentiments of your heart. Quickly order for you! The cake just arrived and it looks very fresh and creamy. On time delivery!! All the roses were very fresh and bright in colours. 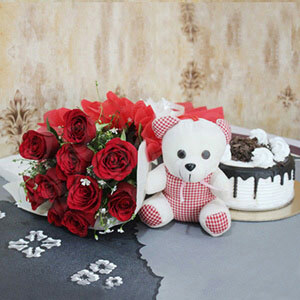 I really loved the shape of all the flowers and taste of the cake and that too under best rates. They have tremendous delivery service that helped me to receive the product on time. 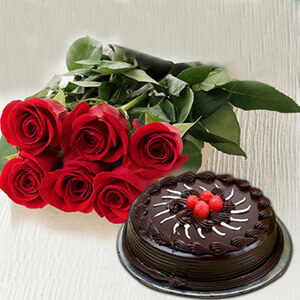 The chocolate cake was really a tasty one with fresh cream and even the roses were received fresh. Delivery was little delayed but still on the right date. I will definitely recommend this site to other and will visit again for future gift shopping. 4 Good gift option it is!! I ordered this combo for my girlfriend on her birthday. Thanks for delivering it on time. Also, thanks team for delivery everything in fresh condition which is really appreciable.